Federal Bank Clerk Recruitment 2018: The federal Bank has been Bank Jobs Notification to fill up Clerk and Officer Scale-I Vacant posts. All the eligible and interested candidates are invited to fill up the Online Application form for the Available posts. The applicants must notice that the Federal Bank Clerk Recruitment 2018 Application Form will not be accepted after the last date. 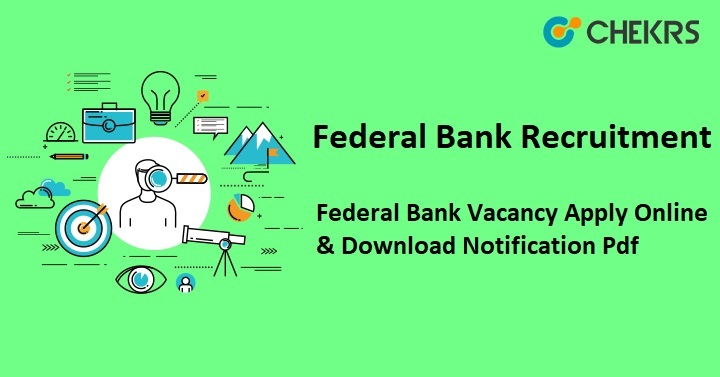 Here we have shared the Latest Federal Bank Vacancy details along with eligibility Condition, Pay Scale, Selection Process and more information. Maximum Age (Officer): 26 yrs. Maximum Age (Clerk): 24 yrs. Here we have shared the Online Application form Complete Process. Interested candidates must follow these given steps and complete application form on or before the last date. After that a new Window will be open and Click on Apply Now Link. Complete the Registration Process with correct Details. Login with Registration ID and password. Take a Print Out of Application Form for the Future uses. Candidates need to check Official Notification Link to gain information related to Federal Bank Clerk Recruitment 2018. If you want to get the latest information direct in your mailbox, you may subscribe our mail service. Keep visiting with our web portal www.jobs.chekrs.com for obtaining updates time to time.